In both social and scientific spheres, Dr. Ben Barres has consistently been an advocate for the little guy. He is openly transgender, and has encouraged open discussion on topics such as the marginalization of women in science. In addition, his research focuses on glia, which could also be considered as the marginalized cells within neuroscience research. Because of this, Ben Barres is a personal inspiration for me, particularly for his advancements in increasing LGBTQ visibility in science. As a queer/pansexual scientist, I have experienced the effects of the marginalization of LGBTQ identities in science. In undergrad at UT Austin, I recognized a widening gap between my identity as queer and as a science lover. I had never known of or met any openly gay science professors or researchers in college. This lack of reflection of my identity in the leaders of the field that I love was both puzzling and a bit discouraging. The path to becoming a professor or an accomplished science researcher is already difficult and extremely competitive. As a result of my lack of knowledge of openly gay scientists, I couldn’t help but wonder, does having an LGBTQ identity add to this difficulty and act as a barrier to higher education and achievements? Are openly gay scientists less likely to achieve success compared to their equally qualified, heterosexual peers? In lab and in my science courses, I became more closeted in order to avoid uncomfortable interactions or even losing internship opportunities or closer relationships with professors because of it. For recent data on the marginalization of LGBTQ identities in STEM, check out the research of Erin Cech (an alum of UCSD!). In 2011, she published a study which found that the heteronormative culture of engineering resulted in prejudices against LGB students that hindered their success in the field. As one of the few out LGBTQ scientists in the country, Ben Barres has contributed significantly to the increase of LGBTQ visibility in science, inspiring myself and other queer students in science to believe that it is possible to be both out of the closet and successful. 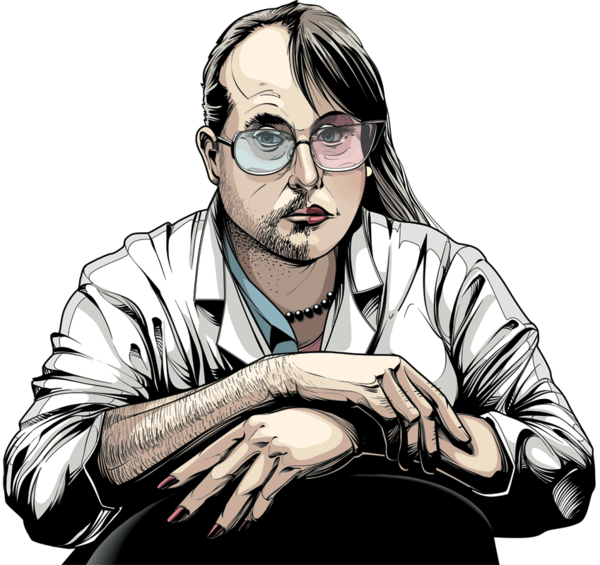 Drawing from his own experiences with transitioning female-to-male within science, he has commented extensively on misogyny within the sciences. In response to ex-Harvard President Larry Summers’s controversial remarks on biological differences as the reason why women are underrepresented in science, Barres wrote a response in Nature titled “Does Gender Matter?”. In the article, Barres writes poignantly, “like many women and minorities…I am suspicious when those who are at an advantage proclaim that a disadvantaged group of people is innately less able.” He goes on to analyze the scientific data of cognitive differences, arguing that the evidence is not substantiated to conclude that women have an innate inability to do science, as Larry Summers claimed. On top of all of this, did I mention how awesome Barres’s science is? His research focuses on “the mystery and magic of glia” (as fabulously phrased on his profile on the Stanford website). Barres has been a leading figure in the field of research on glia, providing evidence for their essential role in neuronal function and pioneering novel techniques for studying glia such as immunopanning. In a recent paper in the Journal of Neuroscience, Barres and the researchers in his lab elucidated the molecular mechanisms underlying cognitive aging, an area which was previously unknown, at least for mechanisms impacting neuronal circuitry. They focused on the protein C1q, which has an important role in the immune response and targeting pathogens for removal. First, they found that C1q protein dramatically increases in the brain with age (reaching levels of ~300 fold at 18-24 months of age in mice). In addition, they found C1q to be present in microglia as well as a subset of inhibitory neurons. Functionally, C1q-deficiency impacts the neuronal circuitry in the dentate gyrus as well as enhances activity-dependent synaptic potentiation in the adult. A) MWM analysis, including reversal learning revealed enhanced cognitive flexibility in aged C1q-deficient (KO) mice. A′) Aged KO mice performed at two reversal learning days as fast as the 3-month-old controls. B) Y-maze analysis revealed intact spatial working memory in aged KO mice. KO mice performed spontaneous alternations in the Y-maze task at all ages significantly above chance (50%) and equally well as the 3-month-old controls. C) Open field analysis confirmed that KO mice have activity levels identical to the WT at both 3 (adult) and 17 months (aged) of age. Figure from Stephan A H et al., 2013. Most importantly, Barres and his team ran a battery of learning and memory tasks to wildtype mice and mice deficient in C1q. 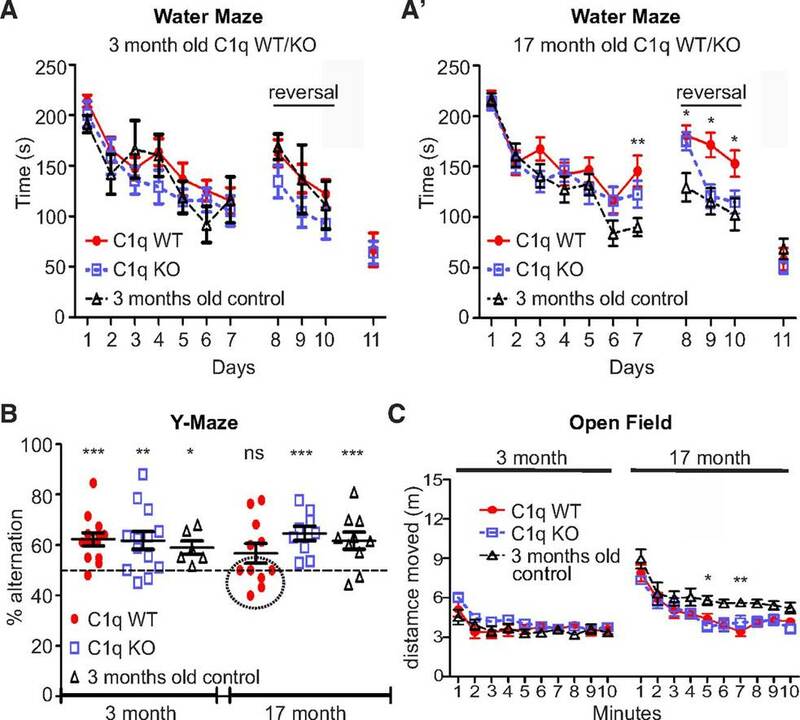 Using tests of a water maze, Y-maze, and open field in young, 3 months old, and aging, 17 months old, they found that C1q deficiency reduced the cognitive decline in the aging mice, as they performed better in these tasks than wildtype. These results not only increase our understanding of the aging CNS, but also provide substantial therapeutic implications for neurodegenerative diseases such as Alzheimer’s disease, if C1q accumulation is shown to play a role in the cognitive decline of AD. Come hear Ben Barres talk about his research while emitting vibes of all-around badassery at his talk on Tuesday, October 29th at 4pm in the CNCB conference room as part of the UCSD Neuroscience Graduate Program Seminar Series. Katie Fife is a first year Ph.D. student currently rotating in Mike Taffe’s lab at The Scripps Research Institute. Her research interests include the molecular mechanisms of addiction and drugs of abuse. Her general interests include an obsession with music, art, and queer culture. Barres, B. A. (2006). Does gender matter?. Nature, 442(7099), 133-136. Cech, E. A., & Waidzunas, T. J. (2011). Navigating the heteronormativity of engineering: The experiences of lesbian, gay, and bisexual students.Engineering Studies, 3(1), 1-24. Stephan, A. H., Madison, D. V., Mateos, J. M., Fraser, D. A., Lovelett, E. A., Coutellier, L., … & Barres, B. A. (2013). A Dramatic Increase of C1q Protein in the CNS during Normal Aging. The Journal of Neuroscience, 33(33), 13460-13474.